Posted on 27, November 2018 by EuropaWire PR Editors | This entry was posted in Awards, Banks, Education, Management, Science, Spain, Technology and tagged Awards, CaixaBank, diversity, female students, Gonzalo Gortázar, Microsoft, Pilar López, science, Spain, STEM, technology, WONNOW Awards. Bookmark the permalink. The WONNOW Awards enable both companies to foster the diversity and presence of women in the field of technology and science from the outset of their career. Gonzalo Gortázar, the CEO of CaixaBank, and Pilar López, the Chairwoman of Microsoft España, delivered an award to the student with the best academic record, who received a 10,000-euro monetary prize. The selection process also included awards given to another 10 students, who will have access to a paid internship to work at CaixaBank and take part in a Microsoft mentoring programme. 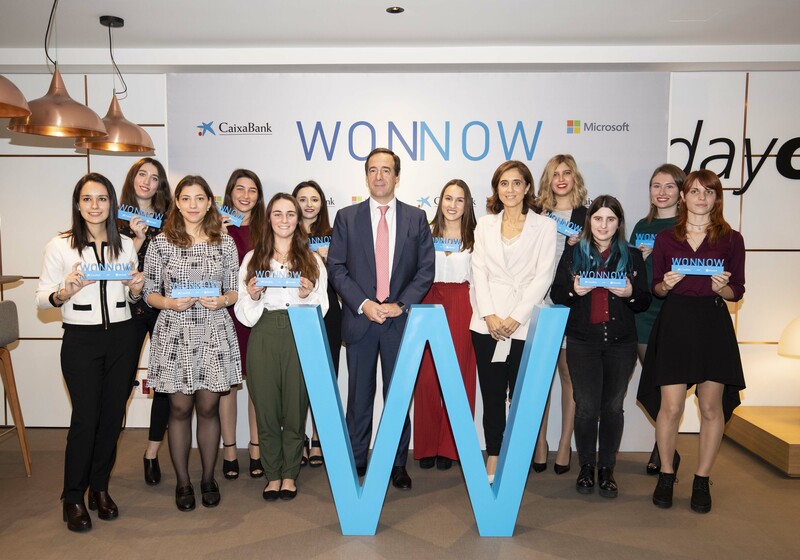 MADRID, 27-Nov-2018 — /EuropaWire/ — Gonzalo Gortázar, the CEO of CaixaBank, and Pilar López, the Chairwoman of Microsoft España, delivered the WONNOW Awards to 11 STEM-degree students – Science, Technology, Engineering and Mathematics – from Spanish universities. These awards enable CaixaBank and Microsoft to foster talent and drive the diversity and presence of women in the field of the technology and science from the outset of their career. This initiative includes 11 awards: one for the student with the best academic record, who received a 10,000-euro monetary prize and, furthermore, 10 students have been given an award providing them with access to a paid internship with CaixaBank. They are offered a 6-month internship contract, with the possibility of joining the company upon completion. Furthermore, they will also benefit from a mentoring programme given by Microsoft, which offers advice on aspects related to developing their career in the technology sector. Carlota Armillas, who is studying a double degree in Mechanical Engineering and Industrial Design and Product Development at the University of Cádiz , has been awarded 10,000 euros. What is more, the following students have access to a paid internship with CaixaBank and will benefit from a Microsoft mentoring programme: Marta García Pérez, studying a degree in Computer Engineering at the University of Cádiz; Carmen Torres Montijano, studying a degree in Technology and Telecommunications Engineering at the University of Jaén; Ana Sancho Callealta, studying a degree in Computer Engineering at the University of Cádiz; Amaia de Pablo Ruíz, studying a degree in Information Management and Systems Computer Engineering at the University of the Basque Country; Helena Yelmo, studying a degree in Mechanical Engineering and Industrial and Automatic Electronic Engineering at the Salesian University School of Sarrià; Marina Alonso, studying a degree in Telecommunication Services and Technology Engineering at the Technical University of Madrid; Patricia Andolz Santacana, studying a degree in Computer Engineering at the Open University of Catalonia; Sara Ruíz Daza, studying a degree in Physics and Mathematics at the University of Cantabria; Naomi Noor, studying a degree in Industrial Engineering and Product Development at the University of Las Palmas de Gran Canaria, and Paula Calderón, studying a degree in Biotechnology at the San Vicente Mártir Catholic University of Valencia. In short, this first annual edition of the WONNOW Awards has honoured four students from Andalusia, two from Catalonia, one from the Basque Country, one from Cantabria, one from the Canary Islands, one from the Autonomous Region of Valencia and one from Madrid out of a total of 260 female students of 59 Spanish universities that took part. Gonzalo Gortázar thanked all the students for taking part and congratulated the winners, who he referred to as “an example to follow”. As explained by the CEO of CaixaBank, “the WONNOW Awards recognise the best female talent in degrees that play an increasingly essential role in the development of our company. With these awards we want to continue to contribute to developing people and society as a whole, driving diversity in the technology industry”. Furthermore, Pilar López was highly satisfied with the high turnout for this first annual edition of the awards and thanked all the university students for their involvement. “Transmitting passion for STEM degrees to young people and kindling their curiosity for the world of science and technology will facilitate the access of more women to the ICT industry, which is fundamental to guaranteeing Spain’s long-term competitiveness. At Microsoft we believe that the best talent must be diverse and nurtured from an early age. The WONNOW Awards – together with CaixaBank – are a good example of our work with companies, associations, non-profit entities, networks of professional women and, of course, with educational institutions, in order to inspire girls and young women and demonstrate that technology and science is not a male-only field”. These awards enabled both companies to honour both the academic and personal excellence of women studying technical degrees, which play an increasingly essential role in the development of our company, but which are subject to a reduced feminine presence. CaixaBank and Microsoft recognise the best talent, showcasing female benchmark students in the STEM sector and promoting diversity in the technology industry. It is a transversal project which aims to highlight the effort and commitment of the women who choose these degrees. The values of social engagement, equality and excellence shared by CaixaBank and Microsoft can be seen in this initiative, which is due to be held on an annual basis. This project enables both companies to show their commitment to fostering gender equality and diversity in the business environment. According to a UNESCO report, just 35% of students enrolled in STEM-related degrees are women, representing 28% of researchers worldwide. According to data from the Society of Women Engineers, more than 20% of graduates in engineering companies in Spain are women, but only 11% are currently operational. The percentage of female university students enrolled in computer engineering drops to 12% and the percentage of males currently active in this sector is three times greater than that of women. This situation contrasts with the high demand of new professional profiles with suitable STEM skills. The European Commission has warned that 90% of all jobs now require digital competences and, within two years, there are likely to be 500,000 jobs in Europe that will not be covered due to a lack of appropriately trained candidates. Equality between men and women in the digital industry would enable the GDP of the European Union to increase by about 9 billion euros annually. However, it will not be possible without fostering the interest of girls and young women in STEM-based studies, providing them with the necessary skills to compete in the digital age. Social engagement is one of CaixaBank’s values which aims to contribute to developing a fairer society with greater equal opportunities. Therefore, it fosters and implements various initiatives aimed at promoting diversity, such as the WONNOW Awards. The bank holds many national and international allegiances and initiatives in corporate responsibility, which are the cornerstone of its identity. Women currently fill 39.6% of CaixaBank’s managerial positions and it has a specific line of action to promote gender diversity. The bank has an Equality Plan to contribute to effective equality between men and women. CaixaBank is the leader in retail banking in Spain, with a 29.3% share among individual customers. The bank has close to 16 million customers on the Iberian market and 5,176 branches. Microsoft (Nasdaq “MSFT” @microsoft) drives digital transformation for the smart cloud and Intelligent Edge era. Its mission is to empower each person and organisation on the planet to do more in their daily activity.